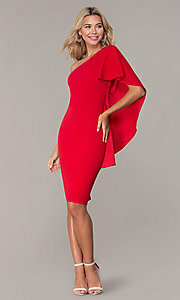 Red hot, this little cocktail dress by Simply is designed to sizzle. The little red dress, crafted in a giving jersey fabric, smooths over the figure in an eye-pleasing bodycon style. With one shoulder bare, this knee-length designer dress has a short open-cape sleeve that adorns the opposite shoulder. For the confident woman on the go, slip into this red cocktail dress by Simply for nights out with the girls, holiday parties, or other semi-formal events.